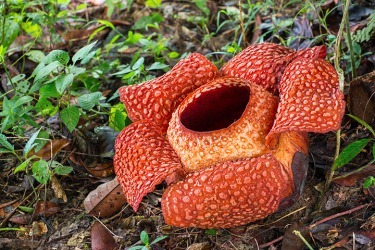 Rafflesia, the biggest flower in the world, has a putrid odor. The definition of putrid is something disgusting, rotting or smelly. Milk that is rotting and going bad is an example of something that would be described as putrid. "putrid." YourDictionary, n.d. Web. 15 April 2019. <https://www.yourdictionary.com/Putrid>. Decomposed and foul-smelling; rotten: putrid meat. Proceeding from, relating to, or exhibiting putrefaction: a putrid odor. Of extremely poor quality; atrocious or contemptible: a good play ruined by putrid acting. Middle English putred from Old French putride from Latin putridus from putrēre to be rotten from puter putr- rotten ; see p&ubremac;- in Indo-European roots. Rotting, rotten, being in a state of putrefaction. of, relating to, or characteristic of putrefaction, especially having a bad smell, like that of rotting flesh. Nouns to which "putrid" is often applied: smell, odor, flesh, matter, meat. From Latin putridus (“rotten, decayed"), from pÅ«treÅ (“I am rotten or putrid"), from puter (“rotten, decaying, putrid"). Outside the fort nothing was to be seen but burnt-down houses and putrid bodies. The "pale" and "light brown" oils are used in pharmacy; the "brown" oil, the cod oil of commerce, being obtained from putrid and decomposing livers, has an objectionable taste and odour and is largely employed by tanners.
" Beagle " found putrid musselshells still adhering to the rocks io ft. Nevertheless, instances were adduced where the most careful heating of yolk of egg, milk, hay-infusions, &c., had failed, - the boiled infusions, &c., turning putrid and swarming with bacteria after a few hours. Why is it that a bucket of water soon becomes putrid, but frozen remains sweet forever?